What is The Boogie Bus ? The Boogie Bus is a fully converted bus that has been fitted out with leather seating and a nightclub style interior. How many passengers can The Boogie bus take ? What is on the Boogie bus? 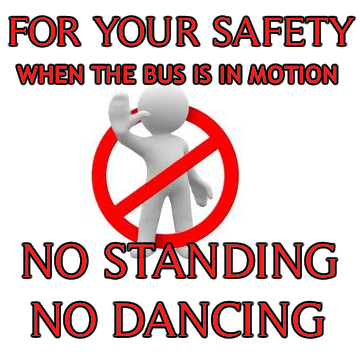 The Boogie Bus has full leather seats and seatbelts for your safety, it has a dance pole and dance floor area, smoke machines,strobe lights,disco lights, touch screen jukebox &drinks holders. What age group is it best suited for ? The Boogie bus company cater for all age groups, we cover Hen party, High school prom, Birthday, Retirement, Engagement, Race day and more. How Much Does The Boogie Bus cost ? A very frequently asked question, we do not have a set price due to a number of factors, Area,Number in party, duration of hire etc so we ask that you give us a call for a quote. What makes your Boogie Bus different from the others? Our Boogie bus has undergone a super refit on February 2011 and no expense spared so we like to think it has that new car smell when you hop aboard.